With an intuitive, Excel-like interface with debit/credit format, Adaptive Consolidation makes it easy to streamline inter-company eliminations, journal entries, and to categorise pre-eliminations, eliminations and adjustments. You always have visibility during the close with Adaptive Consolidation. Financial consolidation happens in real-time – no long-running processes or batch jobs – giving you full visibility at any time, from anywhere. Easily audit your data and track your close with the built-in controls that are core to Adaptive Consolidation. A completely transparent audit trail lets you track who changed values and formulas (and when), and even view new vs old values. 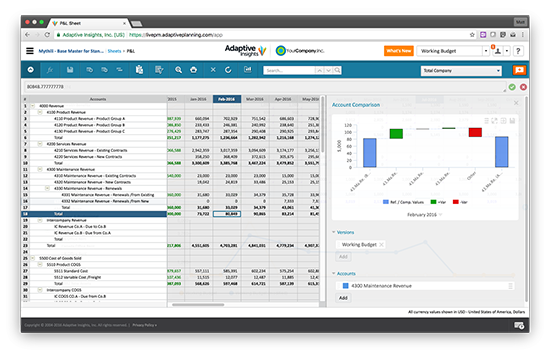 Keep everyone on track – no matter how geographically distributed your accounting team is – with Adaptive Consolidation’s powerful built-in process management. Track and monitor the execution of financial close tasks with this perfect close checklist tool. With Adaptive Consolidation’s built-in and dynamic web reporting, you can drill down into GL accounts – even back to a detailed transaction level. One click refreshes your financial statements, and you can easily deliver formatted board reporting with Adaptive OfficeConnect. XBRL integration has also streamlined the process of moving from “close to disclose”. Built on a common technology foundation and unified with Adaptive Planning, Adaptive Consolidation allows you to pivot from close to budget with a single click. Using a single database for business structure and financial data makes it an easy transition from consolidated financials to plans.